Joos van Cleve is mentioned in various documents in Antwerp as Joos van der Beke, nicknamed Van Cleve. 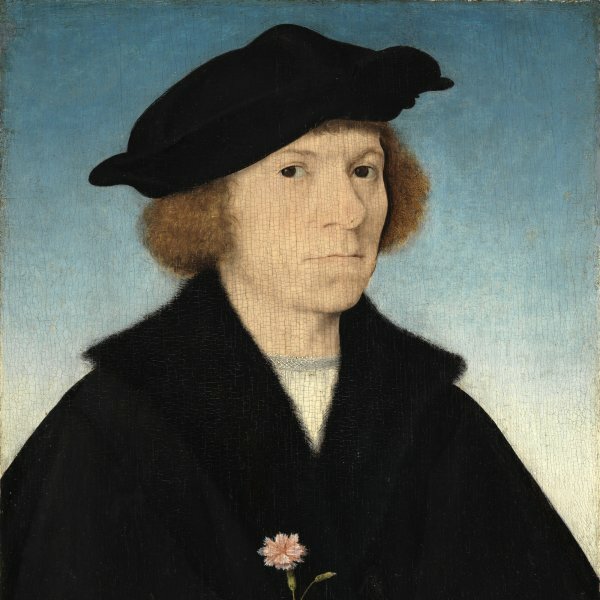 He trained with the painter Jan Joest, with whom he worked on the wings of the altarpiece in the church of San Nikolai in Kalkar, installed in 1508 (still in situ). Van Cleve moved to Antwerp where he is recorded as a master in the painters’ guild in 1511. Documents of the guild confirm that in 1516 and 1523 Joos van Cleve had apprentices in his charge and that he was co-dean of the guild in 1519, 1520 and 1525. The most important work from his early period is The Death of the Virgin (Wallraf- Richartz-Museum, Cologne), which is dated 1515 on its original frame. This composition has been fundamental to the reconstruction of Van Cleve’s oeuvre, as in the late 19th century the art historian Firmenich-Richartz associated the complex monogram on one of the windows with the initials with Joos van der Beke. The artist has also been suggested as responsible for a group of works previously attributed to the Master of the Death of the Virgin. His first paintings reveal the influence of his master Jan Joest, as well as that of Memling and Gerard David. It has thus been suggested that Van Cleve may have spent a period of training in Bruges where he could have encountered the work of the latter two artists. The Pietà in the Städelsches Kunstinstitut und Städtische Galerie in Frankfurt, documented to 1524, marks a new phase in Van Cleve’s work in which his interest in Italian art becomes evident. Between 1528 and 1535 Joos van Cleve’s name does not appear in any register in the city of Antwerp. Guicciardini stated in his Descrittione… di tutti I Paesi Bassi, altrimenti detti Germania Inferiore of 1567 that the artist was summoned by François I of France to work at the French court, where he produced various portraits of the monarchs and members of the aristocracy. Joos van Cleve’s last paintings reveal a profound interest in the Italian Renaissance but there is no concrete evidence that he made a trip to Italy.